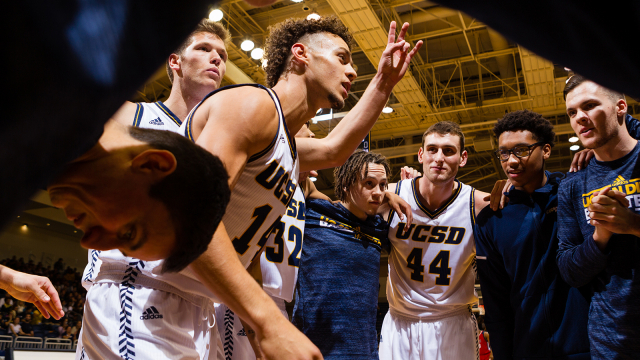 This past week, the UC San Diego men’s basketball team split two matches. It won on Monday at home against Saint Martin’s University 96-69 and lost on the road on Wednesday at Point Loma Nazarene University, 73-75, in overtime. That week, UCSD secured its third win of the season but suffered its first loss of the season. This week, the Tritons have two more games as they will play California State University, San Bernardino at home on Tuesday night and California State University, Chico at home on Saturday night. On Monday night at RIMAC arena, UCSD played a squash match against Saint Martin’s University and defeated the Saints, 96–69. The Tritons stayed hot behind the arc as they hit an astounding 9 3-point baskets in each half, compared to the Saints who only sunk 10 3-pointers the entire game. Within the first minute, UCSD took the lead and never trailed in the matchup. The Saints tied the Tritons only three times during the match but were never able to take the lead. Senior forward Christian Oshita was the star for the Tritons, scoring an astonishing 35 points for the Tritons. For most of the first half, the Tritons kept feeding him the rock and every time he put it up, the whole arena knew it was going in. Oshita scored 10 of the Tritons’ first 17 points of the game. At that point, only seven minutes had passed and Oshita had as many points by himself as the entire Saint Martin’s team. Oshita scored 26 points at the end of the first half and was on pace to break the Tritons all-time single game points record (46). He put up 9 more in the second half to finish the game with 35 points, 4 rebounds, 2 assists, 1 steal, and was 9 out of 12 on 3-point shots. In the second half, the Tritons kept up the fast pace of the first half. After putting up 50 in the first half, they scored another 46 in the second half for a total of 96 points.. After dropping 97 points against Western Washington University last week, no one expected another offensive explosion from the Tritons. As a team, the Tritons shot 18 out of 26 (69.2 percent) on 3-pointers and won their second straight game simply by shooting the lights out against the Saints. On Wednesday, the Tritons had less luck getting the ball to fall and fell to the Point Loma Nazarene University Sea Lions, 75–73, in overtime. They were only 10 out of 31 on 3-pointers for a pedestrian 32.3 percent. Despite that, the Tritons put up a hard fight e from the opening tip off until the end of the game. UCSD led until there was only one second left in the fourth quarter when Point Loma junior forward Sterling Somers had a put-back buzzer beater to move the game into overtime. The Tritons were outscored 11-9 in overtime and suffered their first loss of the 2018-2019 season. In the first half, both teams put up monster numbers. UCSD scored 40 first-half points and Point Loma put up 37. This was a contentious first half, with a lot of back and forth, but the Tritons remained on top. The Tritons were facilitators in the first half as they managed to get the ball moving all around the court. They had 7 first-half assists to Point Loma’s 5. UCSD also had three players, Oshita, freshman guard Tyrell Roberts, and junior forward Scott Everman all put up at least 8 points on the board. As balanced as the first half was, the second half had even more momentum swings with 4 ties and 6 lead changes. Neither team had an inch to each other and in doing so, the score remained tied going into overtime. In the second half, Roberts came alive as he was the Tritons leading scorer with 11 points. Unfortunately, he was unable to hit any of his 3 free throws he was allotted, which comes as a surprise because Roberts is typically a skilled free throw shooter. Roberts cooled off after that hot second half and was not playing his best during overtime. He took and missed 3 3-pointers in overtime which account for 75 percent of the Tritons missed field goals in OT. Despite that, the Tritons remained in the game. With just a few seconds left, Oshita hit a clutch 3-pointer to put the game within 2, but the Tritons were unable to get the ball back. Oshita led the team in scoring for the second-straight game as he followed up his career-high 35 point performance on Monday with 20 points on Wednesday. When the time expired, the Tritons still trailed by 2 and were handed their first loss of the season. The Tritons and Sea Lions are not scheduled to meet again this year, but with how competitive this game was, fans shouldn’t be surprised to see these two teams matched up in the NCAA tournament next spring.